The first time I saw @chinnyco ‘s IG page last year, I was in awe. In addition to being beautiful, intelligent and sophisticated, she is FLEXIBLE! CHINEKE THE THINGS HER BODY CAN DO! So because I am who I am, I told God “Father Lord, I know I can do this, please show me how”. Like “jokingstuffs” I YouTubed “how to do headstands” (hey we all have to start somewhere). One of the clips recommended starting with a wall. I tried it the first time and I was able to kick myself against the wall and stand. Cloud 9 didn’t have anything on me! I was elated. The second time, my body responded again. Feeling myself, I thanked God that it wasn’t beginners luck. A few days later, I tried again. OMG I ALMOST DIED! My body was too far from the wall and I didn’t kick my legs up straight so I fell so hard I almost broke my neck! My sisters in the living room heard the commotion and asked if I was okay? Later I explained what happen and we LAUGHED our butts off! The truth is, that event scared me. I kept remembering it and how I really almost died, so I packed up my mat. December 31, 2014, I decided 2015 will be different. My goal is simple – Perfection. So I pushed myself. Every time I fell, I got right back up. 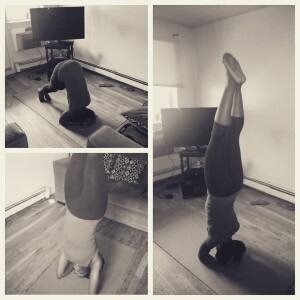 I added yoga to my workout schedule and started meditating. March 21,2015 and look at me now! People, If there is a picture of it, it is possible. So don’t hate on people doing it. Be inspired and MAKE IT HAPPEN! In the words of Paulo Coelho, “the secret of life is to fall seven times and to get up eight times.” So PUSH YOURSELF!